How to change the default language version? From the Solution Explorer, right-click on the project node. Click on Properties from the context menu. From the project properties screen, navigate to the Build tab. Scroll down the screen and click Advanced... button, which you can find under the Output section. This will launch the Advanced Build Settings dialog window on the screen. Select the C# language version that you want your project to target. 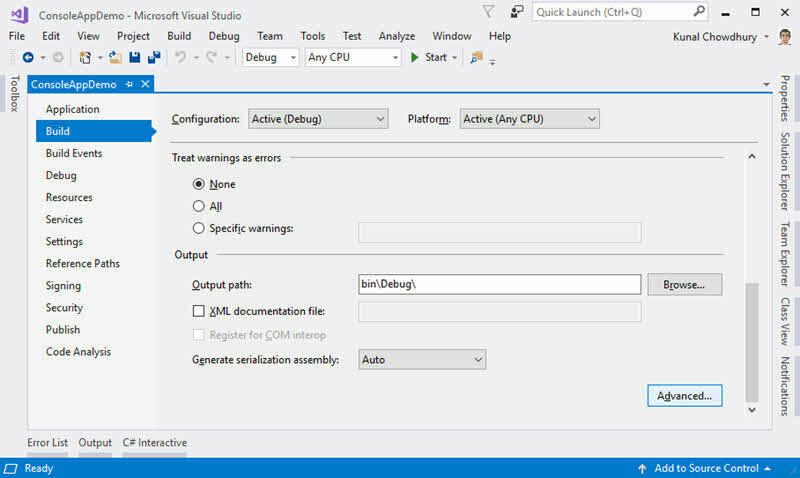 When you select default (Visual Studio 2015) or C# latest major version (default) (Visual Studio 2017), the compiler accepts all valid language syntax that it can support. 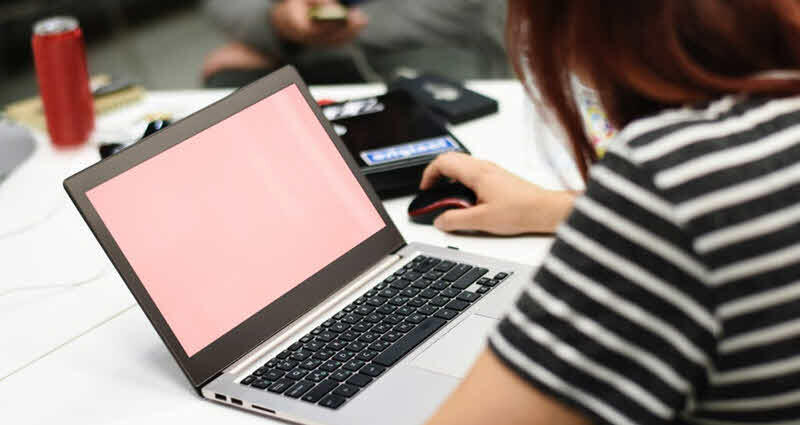 When you select C# latest minor version (latest) (Visual Studio 2017), the compiler accepts all valid language syntax that it can support in latest minor version of the compiler. 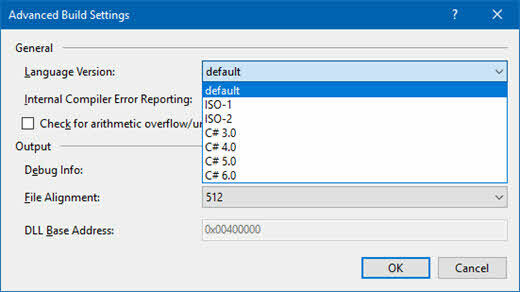 When you select ISO-1, the compiler accepts only syntax that is included in ISO/IEC 23270:2003 C# (1.0/1.1). In case of ISO-2, it accepts only syntax that is included in ISO/IEC 23270:2006 C# (2.0). If you like to restrict it to a specific version, select the one that best suits your requirement. For example, selecting C# 3.0 will ask the compiler to accept only those syntax that is included in C# 3.0 and lower. Similarly, selecting C# 4.0 will restrict it to C# 4.0 and lower. 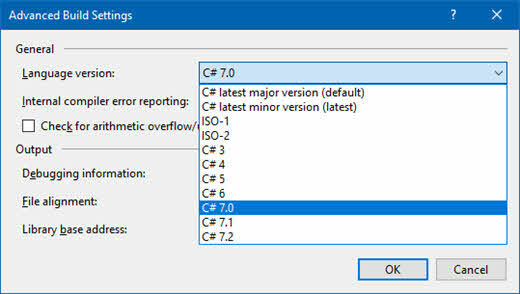 You can chose other values like C# 5.0, C# 6.0, C# 7.0, C# 7.1, C# 7.2 from the list. If you have come this far, it means that you liked what you are reading (How to change the default language version in Visual Studio? ).